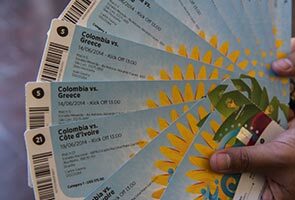 RIO DE JANEIRO: Football's powerful governing body came under renewed scrutiny after a Brazilian police chief said Thursday a FIFA member provided thousands of World Cup tickets sold illegally at games for millions of dollars. Police commissioner Fabio Barucke said "someone from FIFA" and "an intermediary from Match Hospitality", FIFA's ticket agency, had channelled the tickets onto the black market. The FIFA figure, whom police are trying to identify, is believed to be staying at the Copacabana Palace, a luxury Rio de Janeiro hotel used by some FIFA hierarchy at the World Cup, Barucke told reporters. Brazilian police on Tuesday arrested 11 people accused of selling tickets that may have been obtained through a contact at football's governing body. The tickets are normally reserved for sponsors, football federations, players and non-government organizations. A police investigation dubbed "Operation Jules Rimet" after the former French FIFA president was launched without FIFA's knowledge, the police chief said. Following the arrests, "we are now calling for FIFA's assistance to help us identify this FIFA person, a foreigner staying in the Copacabana Palace hotel," Barucke said. FIFA president Sepp Blatter, under fierce pressure over the Qatar claims and other alleged corruption at his organization, said he was unaware of the case, according to Estadao newspaper's website. "I don't handle tickets. I handle politics," Blatter was quoted as saying. FIFA marketing director Thierry Weil said the organization "is fully supporting the local authorities in their investigations into ticket scalping and any illegal sale of FIFA World Cup tickets." He added: "FIFA and the local authorities will ensure that any violations will be sanctioned accordingly." Initially, police thought that Mohamadou Lamine Fofana, a Franco-Algerian based in Dubai, was the central figure, Barucke said. "But after his arrest we realized there was someone above him from FIFA with an intermediary at Match Hospitality," he added. "We want to identify the last link in the chain, from the ticket touts at the stadiums, right through to those who are above Lamine Fofana and who passed the tickets on to him," said Barucke. He added: "We have indications that at least one person from FIFA passed on tickets" to Match Hospitality. Brazilian authorities said Wednesday they suspected members of the Brazilian, Argentine and Spanish football federations were involved in the scheme. Marcos Kac, the Rio de Janeiro investigating magistrate in charge of the inquiry, said Wednesday that at least 1,000 tickets per game were involved with a basic price of 1,000 euros ($1,365). There are 64 games in the tournament, but it was not known how many the touts had targeted. The brother and agent of former Brazil star Ronaldinho, Roberto de Assis Moreira, faces questioning in the case, but is not under investigation, Kac said. Of those arrested -- nine in Rio and two in Sao Paulo -- 10 have refused to talk, Barucke said. The suspect cooperating said ticket prices "could have reached 30,000 reais ($13,600) for a final involving Brazil," said Barucke. Police intercepted 50,000 phone conversations and have so far listened to 25,000, he said, adding that police would collaborate with foreign forces to make further arrests. The tickets arrived by air in Brazil and middlemen took them to resell at stadiums. One of the resellers had informed on Lamine Fofana, and an ethnic Chinese in Sao Paulo was also being sought, Barucke said. Barucke said the suspect obtained tickets "through Match Hospitality, which suggests FIFA involvement." Lamine Fofana rented a house in western Rio belonging to former Brazil international Julio Baiano, where he allegedly held parties "during which the tickets were distributed," the police chief said. He is now detained at the house. The suspects face charges of blackmarket dealing and money-laundering.